Add warmth and elegance to your home by turning to the professionals at Flooring America of Scottsdale for truly beautiful wood floors. Offering natural beauty that can last for decades, hardwood is one of the most sought-after flooring materials on the market. For centuries, people have used wood floors. In fact, some homes that were built more than 100 years ago still have original hardwood floors. Over the decades, manufacturing technology has strengthened wood planks even more and has produced planks using unique species. Get beauty that lasts by browsing our selection of hardwood flooring in Scottsdale, AZ. When you turn to our team, you'll find that the selection and installation processes become much easier. Our sales staff talks to you to gather information about your style preferences, how big or small your project is, and where in the house you want to put your new floors. They then help you narrow down the options to the ones that match your needs. Many people don't realize the amount of variety solid hardwood flooring offers. 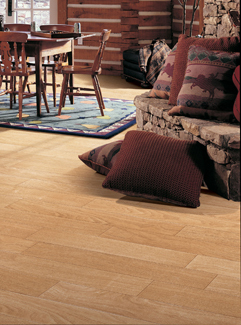 From narrow planks in light hues to thick planks in warm, rich tones, we have it all. Work with our in-house designers to see what different styles may look like in your living space. This way, you know exactly what to expect before spending a single cent. Several of our customers already have wood-look tile in their kitchens or bathrooms and want real wood floors to match in the rest of the home. Our hardwood floor installation experts are available to do in-home consultations so we can get as close to a perfect match as possible. One of the biggest benefits of hardwood flooring is its longevity. However, the durability of your floors depends largely on the materials and installation methods used. Because of our Lifetime Installation Guarantee, you can always count on us to use superior hardwood flooring installation techniques that make the results last as long as possible. Because hardwood lasts so long, it's also a great investment in terms of your property value. Homebuyers love real wood and are willing to pay a lot more to have it already in place before they move in. Contact us today to learn more about our hardwood flooring products. We proudly serve the communities of Scottsdale, Arizona, including McCormick Ranch, Gainey Ranch, Pinnacle Peak, and Grayhawk.